Arguably the biggest news to come out of Night of Champions 2015 was related to an entirely different event. Brock Lesnar vs. The Undertaker III was announced and it won’t be taking place where many of us expected to see it. The rubber match will take place in a few weeks at Hell in a Cell. That puts the match at around six months or so ahead of schedule. The rubber match will also be taking place inside the Hell in a Cell contraption. This is about more than just Hell in a Cell, this is about WrestleMania 32 and the match it lost. Most of us were surprised when Lesnar vs. Undertaker was announced for SummerSlam but I don’t think anyone expected to see the match again until 2016. The set up was relatively simple as the rubber match was tailor made for WrestleMania. Some even speculated that the match would cap off the legendary career of the Undertaker. I think we can all safely presume that the chances of seeing that match at Mania are very slim. So what happened? Did something change in the last thirty days or did something change a few months ago which expedited the program at SummerSlam? My hunch is that when Taker won at SummerSlam, the WWE creative team already had plans to wrap up the feud at Hell in a Cell. This of course leaves both of them free for Mania. I think the obvious answer to this riddle would be the Rock. The WWE has tried to book Rock vs. Brock for Mania a few times now since Lesnar returned a few years back. For several reasons, the match has been delayed and scrapped, with many presuming we’d never see it. My guess and it’s purely a guess is that Vince McMahon locked down the match at WrestleMania, which expedited the final chapters in Undertaker vs. Lesnar. 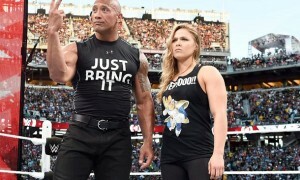 Rock has been rumored to be on board for WrestleMania for some time now. The presumption is that the angle shot at 31 was to set up some kind of match involving Rock vs. Triple H. It would seem odd for Rock to come back and not wrestle Triple H, although I have no interest in seeing the match. Perhaps Rock vs. Brock is a set up for a future match with Rock vs. Hunter. I can’t think of any other plausible reason that Brock would be rescheduled for the Dallas event. Lesnar’s booking on the Stone Cold Podcast has also started quite a buzz. 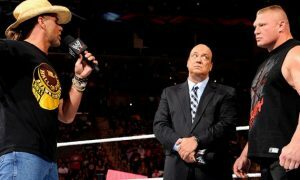 Is the booking the first step in a big angle to set up Austin vs. Lesnar at Mania? Austin has pretty much shot down any and all rumors of a comeback. I think at this point it’s wishful thinking, although I’d love to see it. 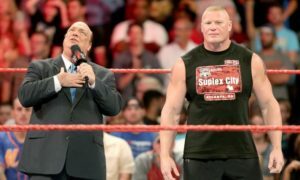 Lesnar challenging for the WWE world title is also another possibility. I don’t think there is any way in the world that Seth Rollins makes it to Mania with the title. If I was to take a total stab in the dark here I’d guesstimate that a heel Roman Reigns would rematch Lesnar at the upcoming event for the WWE world title. Lesnar’s business with the WWE world title is far from complete. Where does this leave Undertaker? I would guess that regardless of reports disputing it, that WWE was moving towards a Sting vs. Undertaker match. Now that said, Sting’s career is in serious jeopardy after suffering an injury at Night of Champions. 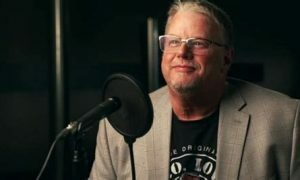 Even if that was the plan, the WWE has to be looking at a Plan B. What do you do with Undertaker in Texas? Anything you want! He wrestled Bray Wyatt this year! Now this is Dallas Texas and the WWE is gearing up for a big event. I have predicted Undertaker vs. John Cena for about the last five years and been wrong every time. The match would mean far less without the streak but it’s a fresh match and I think you could spin a heck of a storyline out of it. Other than Cena I don’t see any big match potential for Undertaker, other than maybe a heel Roman Reigns. Regardless, we are getting Undertaker vs. Lesnar early which means something has changed. Let’s hope it’s for the better!